This is comfort food at it’s finest. For us this was a new recipe that I followed exactly and after the family devoured it was agreed that the original recipe is perfection. This was an easy meal for a Sunday and paired very well with mashed potatoes and corn. If you have about an hour to spare, this dinner could be eaten any night of the week. 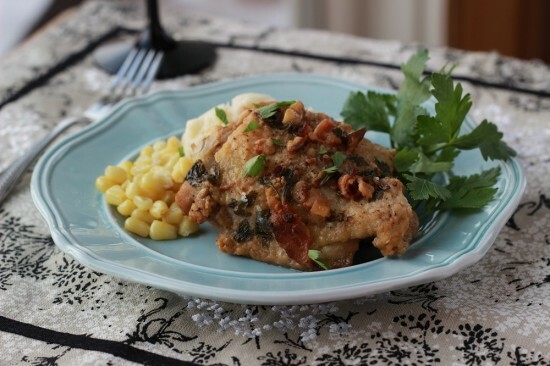 Butter, bacon, chicken, wine….what’s not to like? In an oven safe pan, cook chopped bacon over medium-high heat until crisp. Transfer bacon to a bowl; set aside. Add oil to skillet and brown chicken on both sides until golden brown. Transfer to a plate and set aside. Add garlic to the skillet, and cook, stirring, until golden brown, about 2 minutes. Add stock and sherry to the pan. Return chicken to the skillet. 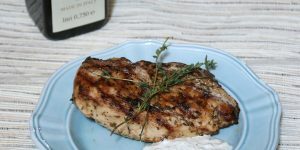 Sprinkle the chicken with cooked bacon, chopped parsley, and then top with butte cubes. Cover and transfer skillet to oven for 30 minutes. Baste several times during cooking, Remove the top for the last 10 minutes and cook until done.